An untold number of people who work at the Nestlé facility south of Guelph are losing their jobs. When contacted regarding reports that Nestlé Waters Canada had laid off workers at its bottling plant and head office in Aberfoyle, the company’s corporate affairs director, Jennifer Kerr, emailed a statement. The company “has been facing some business challenges over the past year,” it said. “From a North American perspective, we are evolving our business to better align our current operations to meet our future needs and position our company for long-term success. In Canada, the beverage industry is highly competitive and we are constantly evaluating our business and making adjustments. “In 2018 we have faced some strong headwinds, including unprecedented cost increases. As a result, we have had to make the decision to make a permanent reduction in our workforce,” it said. The statement went on to say that “impacted associates” were being offered severance packages and “outplacement services” to help them transition to new jobs. Kerr declined to answer any questions, including the number or types of jobs lost. “Our of respect for our employees privacy we are not releasing the number of or positions of impacted employees or any further information,” she said. According to information provided to the Mercury Tribune a couple of years ago, the company employs more than 300 people in Puslinch Township. 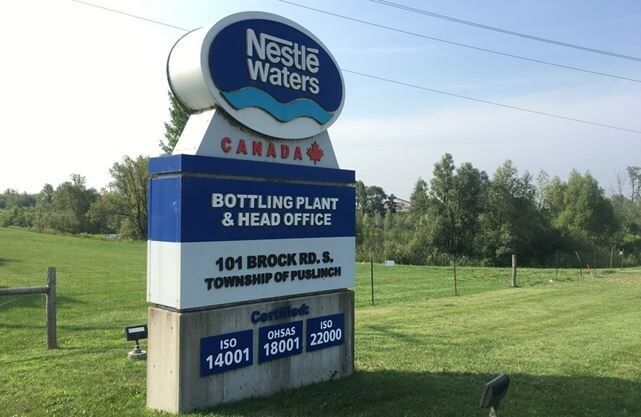 In 2016, Nestlé purchased the Middlebrook well near Elora, beating out the municipality with its bid, but provincial moratorium on new water-taking permits or expansions for water-bottling operations has prevented the company from using the well. Kerr would not say whether the moratorium, which the province is now looking at extending, had impacted the company financially. In 2017, the province increased the fee for water bottlers by $500 per million litres of groundwater, raising it from $3.71 to $503.71 per million litres. Under the conditions of an expired permit, Nestlé is allowed to take 3.6 million litres of water per day at its Aberfoyle facility.